Hi! I’m Kelly, a public relations professional by day and DIY enthusiast by night. I love a good garage sale and trying to turn trash into treasure. I am by no means a design expert; a novice is more accurate. I’m learning as I go while my husband, Jamie, and I work on updating our very first home. It’s a 1937 colonial in the suburbs of New Jersey. It boasts over 1,900 square feet with three bedrooms, 2.5 baths and a tiny galley kitchen. It has great bones and charming chestnut trim, but there are quite a few projects we’re tackling to truly make it our own. We hope to fill our home not just with furniture and decorative items, but also family, laughter, memories, and love. 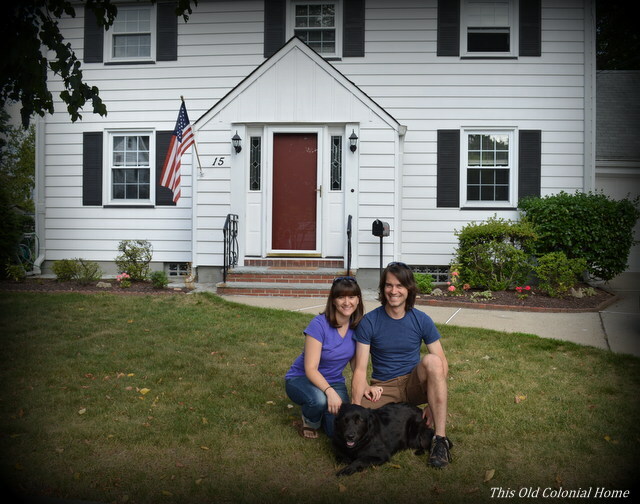 Thanks for stopping by and joining Jamie, Luca, and me on our journey in this old colonial home. I love the woodwork and fire place. I like your decorating style. All I could think about is how I can’t do a lot of the small details because our cats are into everything. Thanks for sharing the website. I am excited to see what else you renovate.